Can you tell me about yourself and what you designed? D: My name is Daniel. I'm part of Radical Norms, and today at Ontario Science Centre, we're creating these human circuits. 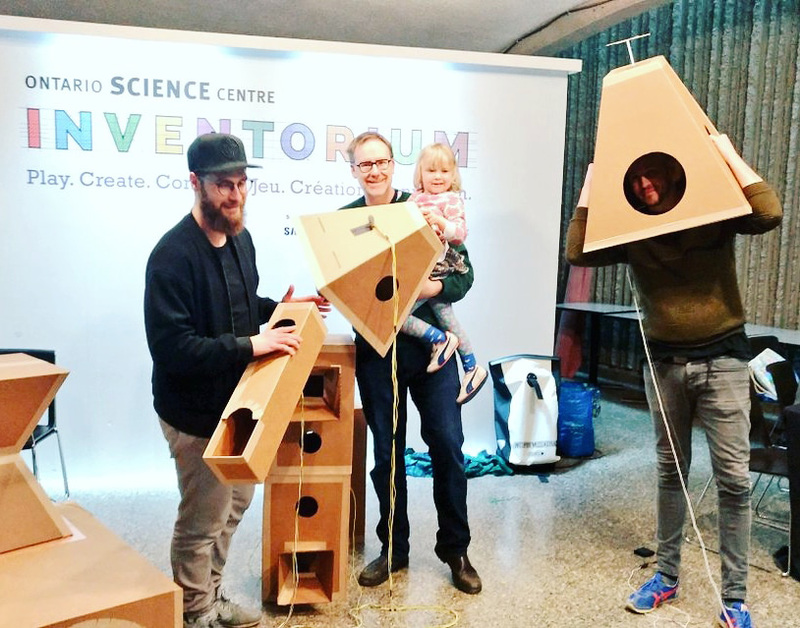 We built these cardboard structures where kids can take on different parts as connectors, making different things light up or speakers play sounds based on their proximity and different touch points. They're called, I guess, human connection giant circuit boards. Can you tell me about yourself and if there's a specific audience you designed for, as well as the purpose of the project? K: I'm Koby - also part of Radical Norms. For this project, we designed for kids (who were around the age of eight) to just embody the idea of electrical circuits. Also to be playful and try to figure out things through physical interactions. What is the meaning behind the name Radical Norms? D: We like to look at different technological trends and we try to figure out the tendencies of human interactions. We map it out and find potential new ways- new interactions, new ways of being human. I guess one thing we really focus on is prototyping and making; not just coming up with conceptual ideas about futures. It’s also about making ideas and things real through experiences and different design prototypes. K: Radical Norms is also the concept of the future mundane. We are thinking about the future from really basic human interactions. What is something in the world that you're tired of? D: American politics?! I wouldn't say that I’m necessarily tired of anything... more just feeling the same. In that, I think, we find opportunity to change things. Be it political, technological, or be it the 1% who holds the power of mostly everything. These things pose challenges and opportunities to find new ways to activate people. I'm not really tired of anything. I'm more curious of everything, and I think that's one thing Radical Norms really embodies. It's curiosity and the need to try to change things, or at least shed a light on how things can be changed. On a scale of 1 to 10 how excited are you about life? K: I'm very very very excited! I think it's because we're living in an interesting time where every day something happens- a lot of it is really really bad. But it leads to so much opportunity to change things and recreate the system that is controlling our lives. I think that's the best place to be. D: We live in radical time and that's an exciting. What do you look for in a person to work with or partner with for an upcoming project? D: A wide diversity of skills and perspective. Someone who challenges the way we do things but also contributes to creating things. We like to make different things, play with code, and play with different objects. K: I'm really against experts- people who just consider themselves experts in one field. For me, it's always about finding people who are really open to everything and flexible enough to understand different perspectives. K: I think flexibility. The ability to go between things very fast...the idea of not just being in a routine. D: Always being uncomfortably comfortable! What is your life motto going forward from now? D: I don't really live by mottos. One thing I just said, being comfortable with the uncomfortable, is something that I've been trying to live with. I think it's because nothing can be defined and nothing is always certain. It's about being okay with those things, and being flexible and open and without getting that tunnel vision… just allowing for whatever randomness to manifest and become. D: If there are they must be radical.